LONDON—Claiming they wanted a ceremony that reflected who they really are as a couple, Prince Harry and Meghan Markle revealed Wednesday that they were debating between a Hawaiian luau- or X-Files-themed wedding. 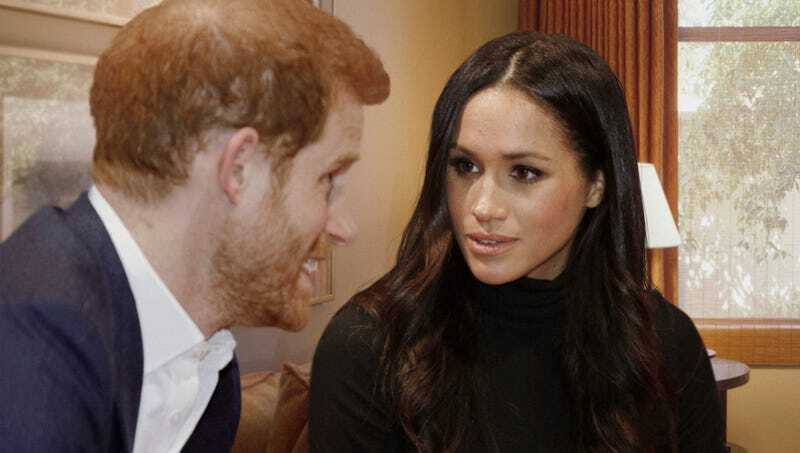 “At first I thought it would be fun to have a Hawaiian wedding because I love the beach, but Meghan is a huge X-Files fan, and having ‘I want to believe’ printed on the invitations would be pretty great,” said Prince Harry of Wales, noting that Meghan has dreamed about walking down the aisle to the X-Files theme music since she was 12 years old, and that it would be a nice touch to have personalized vows that ended with “Do you promise to seek the truth that is always out there?” “I still think a luau would be a blast though. You can get hundreds of leis for, like, 30 bucks. We could serve poke, kalua pork, and tropical drinks in those cool tiki cups. Plus, all the bridesmaids would be dressed up like hula dancers in grass skirts.” Prince Harry added that they were also considering a compromise by going with his grandmother Queen Elizabeth II’s suggestion of a Star Trek theme.